What is WorkerTech, it it a real thing? Listen to the WorkerTech Podcast to find out. If you’ve been following BGV you’ll know that we’ve been talking about WorkerTech for a while now. In fact, it’s become one of our core investment themes thanks to our partnership with Resolution Trust and Accenture. We first coined the term ‘WorkerTech’ in an early conversation with Gavin Kelly at Resolution Trust in 2016, and since then it’s stuck. But a lot of people still ask, ‘What is WorkerTech?’ and, ‘Is it a real thing?’. To help explore this we’ve collaborated with our friends at Tech for Good Live to produce the new WorkerTech Podcast. The podcast series launched this week and I highly recommend you have a listen. Over three episodes host Rebecca Rae-Evans interviews a bunch of experts and investigates what WorkerTech is with a healthy dose of scepticism. In the first episode Rebecca interviews Fabian Wallace-Stephens from the RSA, Dan Tomlinson from Resolution Trust and Linda Wickstrom from Accenture. They talk about how the nature of work is changing, and the role technology is playing in that. There is a bit of debate about the extent of change that will come with automation in the workplace, and an acknowledgement that the people most likely to be left behind are the people who are already disadvantaged and disenfranchised. 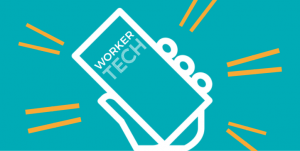 Rebecca also has a quick chat with me, and I attempt to give a definition of what we mean by WorkerTech, that is: | “A technical innovation designed to improve the lives of workers”. Episode two looks at real examples of WorkerTech – innovations that have helped empower workers and have had a positive social impact on their lives. Rebecca interviews Usman Mohammed from Organise, a BGV funded startup that helps workers improve their pay and working conditions. He talks about a recent example where Amazon workers used Organise to come together online and petition against excessive targets in Amazon warehouses. For the final episode Rebecca tackles the gig economy – is it good, bad or something in between? She interviews Guy Levin at Uber HQ about their approach to supporting drivers, and she talks to an Uber driver about his experiences. Then she chats to Duncan McCann from the New Economics Foundation about CabFair, an attempt at an alternative Uber. You’ll have to listen to the episode to find out what happens. Rebecca wraps up the series by saying that there is so much more we could cover with this topic. It would be great to profile more of the many WorkerTech ventures that are emerging, and speak to some of the beneficiaries of these initiatives. Hopefully we’ll come back and explore this some more. For now, we hope you’ll enjoy listening to these three episodes and share them if you find them interesting. We’d love to hear your feedback and any comments. If you know anyone working on a WorkerTech initiative then put them in touch with us. 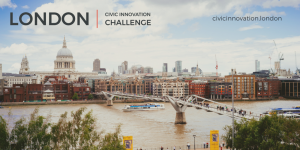 We have funding and business support available for promising WorkerTech ventures, thanks to our partnership with Resolution Trust and Accenture UK. 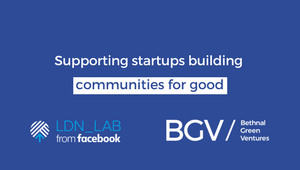 Find out more about the BGV accelerator programme and apply here. Finally, if you’d like to connect with people working in this field then sign up to our WorkerTech meetup group and come along to our event next Monday 21st January, here at BGV’s offices in Toynbee Hall, London. A big thanks to everybody that contributed to the WorkerTech Podcast: Linda Wickstrom from Accenture, Usman Mohammed from Organise, Fabian Wallace-Stephens from the Royal Society of Arts, Dan Tomlinson from Resolution Trust, Guy Levin from Uber, Duncan McCann from the New Economic Foundation, Rachel Carey from Zinc, and the many Uber drivers that talked with the production team.